The Western Maryland Scenic Railroad is an excursion based in Cumberland, Maryland operating part of former Western Maryland Railway’s "Connellsville Extension" which once linked the city with Connellsville, Pennsylvania. Today, the WMSR maintains nearly 17 miles of the former WM corridor to Frostburg. This segment includes several scenic locations which includes "The Narrows" just west of Cumberland, 914-foot Brush Tunnel, and finally famous "Helmstetter's Curve." Today, the railroad currently operates only diesel-powered although it has long been known as a steam-powered attraction. 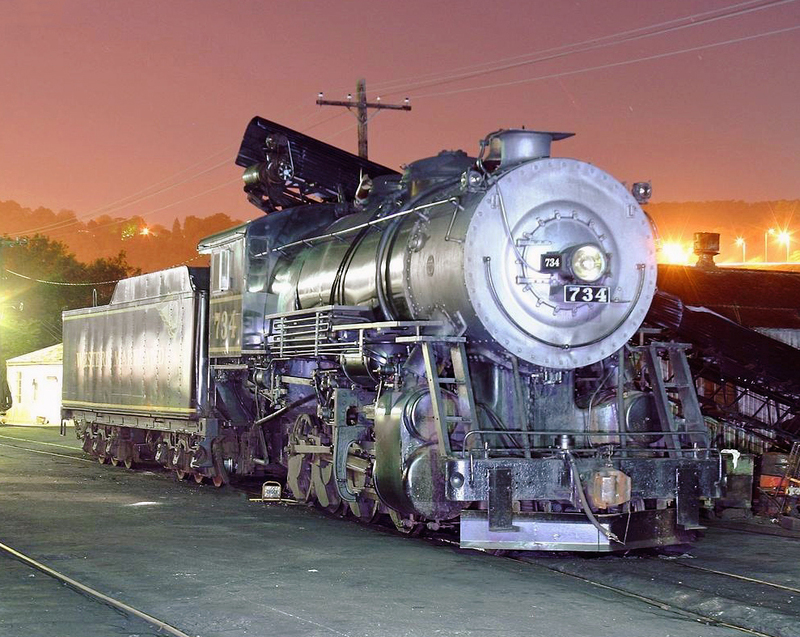 For many years its trusty 2-8-0, #734, led the way. However, this Consolidation is currently undergoing its mandatory 1,472-day inspection and rebuild (as required by the Federal Railroad Administration). The railroad is also restoring 2-6-6-2 #1309, which it believes will greatly increase ridership once completed. While there have been numerous delays with #1309's overhaul, as well as an unforeseen landslide in 2016, WMSR remains one of the state's top tourism destinations enjoying up to 40,000 riders annually. The railroad offers its guests a wide range of services, including on-board dining and alcohol/wine tasting trains. They also expect the big 2-6-6-2 to be ready to roll within the year. Western Maryland Scenic's current route was once part of the Western Maryland's original main line connecting Cumberland with Connellsville, Pennsylvania where the company had friendly connections with other railroads like the Pittsburgh & West Virginia. The two were part of the so-called "Alphabet Route", a consortium of railroads which offered high-speed service between between the Northeast and Midwest in competition against the three major trunk lines (Baltimore & Ohio, Pennsylvania, and New York Central Central). These systems included the Nickel Plate Road, Wheeling & Lake Erie, Reading, Central Railroad of New Jersey, Lehigh & Hudson River, and New York, New Haven & Hartford. The Western Maryland's heritage began as the Baltimore, Carroll & Frederick Rail Road Company chartered in 1852. 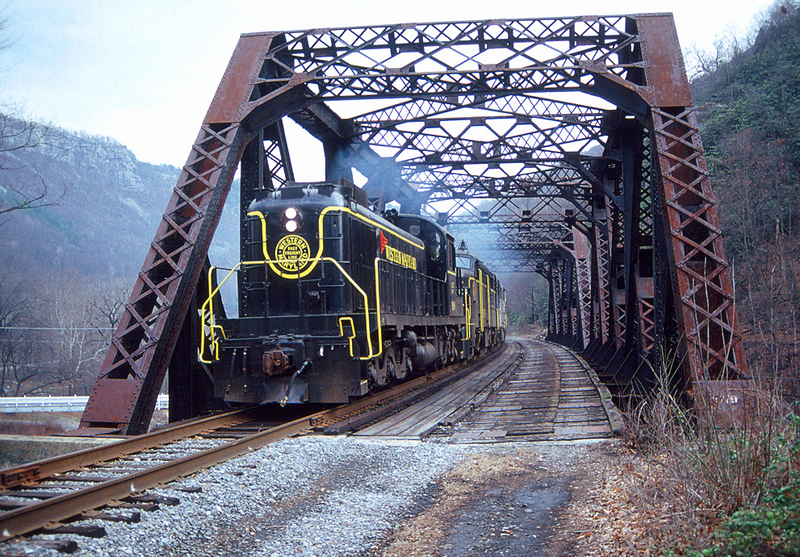 According to the book, "The Western Maryland Railway: Fireballs And Black Diamonds" by Roger Cook and Karl Zimmermann, the road's promoters initially planned it to link Baltimore with the Monocacy River near then-Virginia's northeastern border (today, West Virginia's Eastern Panhandle). It was renamed as the Western Maryland Rail Road Company in 1853 and by 1872 had opened to Hagerstown. On May 7, 1902 George Gould's Fuller Syndicate acquired the Western Maryland from the city of Baltimore. At the time, the WM was only a regional operation linking Baltimore with a B&O connection at Cherry Run, West Virginia (located just across the Potomac River from Maryland it was about 25 miles west of Hagerstown). There were also secondary lines reaching Gettysburg and Shippensburg, Pennsylvania. For Gould, his plans involved utilizing the WM as the eastern component of his planned transcontinental railroad, a dream long-held by his late father, Jay (the notorious tycoon). At the time he already controlled the Western Pacific, Rio Grande Western/Denver & Rio Grande, Missouri Pacific, Wabash Railroad, Wheeling & Lake Erie, and Wabash-Pittsburgh Terminal Railway. As part of this endeavor he would push the WM westward to a connection with another of his properties near Pittsburgh, Pennsylvania. The railroad reached Cumberland in 1906 but, while still under construction, Gould overextended his financial resources and the Western Maryland Rail Road entered bankruptcy on March 6, 1908. It was reorganized as the Western Maryland Railway on December 1, 1909 and the 86-mile Connellsville Extension was completed on August 1, 1912. Its completion opened a western connection with the Pittsburgh & Lake Erie although its most important interchange here took place when the Pittsburgh & West Virginia finally completed its eastern link to Connellsville in the spring of 1931. Soon afterward the "Alphabet Route" was launched. The Connellsville Extension opened the shortest rail route from Pittsburgh to Baltimore, featuring even lower grades than the Baltimore & Ohio's. The line had been built under two subsidiaries; 18 miles of double track from Georges Creek Junction to Colmar (near the Maryland-Pennsylvania state line) were constructed as the Georges Creek & Cumberland Railroad Company. The remaining 68 miles were built as the Connellsville & State Line Railway. In May, 1944, the WM acquired the Cumberland & Pennsylvania Railway, a system which closely paralleled its main line between Cumberland and Frostburg. It ran as far south as Westernport where it reconnected with the WM and B&O. The C&P was primarily built as a coal hauler with a heritage dating back to 1850 and had once been managed by the WM during World War I (1917-1920). In 1927 the WM had largely abandoned segments of the Georges Creek & Cumberland in favor of the C&P, the former of which was only used to serve various coal mines. The Connellsville Extension remained WM's most important corridor throughout the railroad's corporate existence where high-speed freights operated to either Baltimore or the Reading connection at Shippensburg. During the steam era big 4-6-6-4 "Challengers" operated west of Cumberland while the tried-and-true 2-10-0 Decapods also found regular assignments within this territory. During the diesel era, Electro-Motive power was common such as F7's, GP35's, and SD40's. The WM, as a truly independent carrier, ended in 1964 when the Chesapeake & Ohio and B&O jointly applied to acquire the railroad, a move granted by the Interstate Commerce Commission (ICC). Under this setup the Western Maryland Railway continued to operate mostly independent until the 1972 formation of Chessie System, Inc. The new holding company controlled all three roads and, after its creation, began abandoning large sections of the WM. This included the Connellsville Extension which the railroad petitioned for abandonment as of June 11, 1973. Specifically it asked to remove 125 miles between Hancock, Maryland and Connellsville, Pennsylvania, except for a segment between Cumberland and Frostburg. This nearly 17-mile section remained through the CSX Transportation era until the city of Cumberland eyed it as a possible tourist attraction. What resulted was a joint effort; Allegany County ponied up $585,000, the city $2,470,560, and the city of Frostburg $338,427 to purchase the corridor. As part of the deal the new Western Maryland Scenic Railroad was given the old WM shops in Ridgeley, West Virginia (across the Potomac River from downtown Cumberland). Part of this money also went into the restoration of WM's grand station in Cumberland (originally completed in 1913 it is now home to the Western Maryland Station Center, Alleghany County Visitors Bureau, and C&O Canal National Historic Park Visitors Center) while a private individual meticulously restored the 1891, Cumberland & Pennsylvania wooden depot in Frostburg. In 1995, the state of Maryland acquired everything for $2.06 million. One of the notable features of the WMSR's operations is Western Maryland's famed Helmstetter's Curve, which is located just west of Cumberland. This photogenic location features a long, sweeping curve as it bends around a local farm whose barn is the centerpiece (a new structure replaced an older one in 2009 after it burned). In 1991 steam arrived at the Western Maryland Scenic Railroad when it acquired a former Lake Superior & Ishpeming 2-8-0 from the Illinois Railway Museum. A year later the railroad had the steamer in service and repainted it into Western Maryland colors. Aside from the 734, below is a complete diesel and steamer roster of the WMSR. 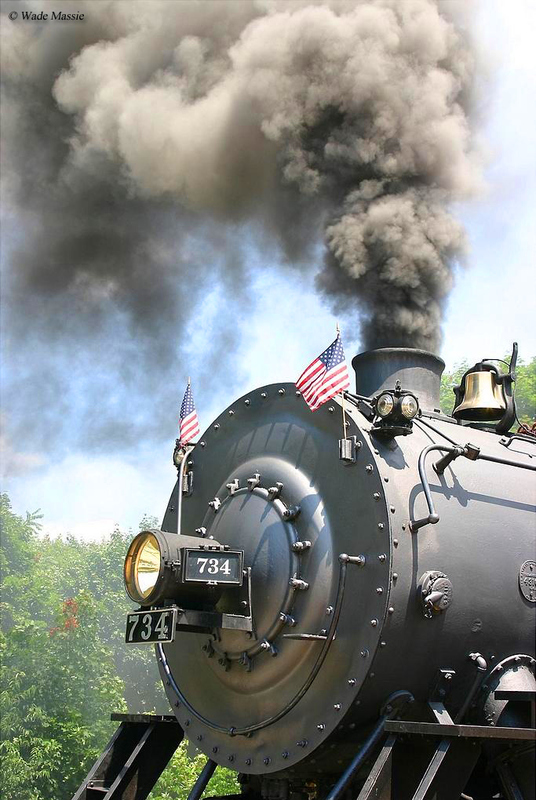 The railroad’s standard excursion takes you on a 4 ½ hour journey from Cumberland to Frostburg (where the locomotive’s are turned on the WM’s original turntable located in the town) and back again with a 1 ½ hour layover in the town. * This locomotive appears as one of Western Maryland's trusty Class H-7 Consolidations. These workhorse 2-8-0's could be found all over WM's system. To further add to this appearance #734 sports the tender of New York Central 4-8-2 "Mohawk" #2662. Aside from the WMSR's standard excursion they also operate specials like murder mystery trains (which includes a full on-board meal) and special holiday runs. Other neat features include cab rides, caboose rentals, and even the Allegheny Highlands Trail for hiking and biking (this trail utilizes the former Connellsville Extension). All in all, the Western Maryland Scenic operates through some of the most beautiful parts of the Appalachian Mountains and if you’re ever in the western Maryland region or Cumberland I would strongly suggest a visit to the railroad. Lastly, if you have the time please consider volunteering to help them with not only restoration work but also maintaining their railroad. 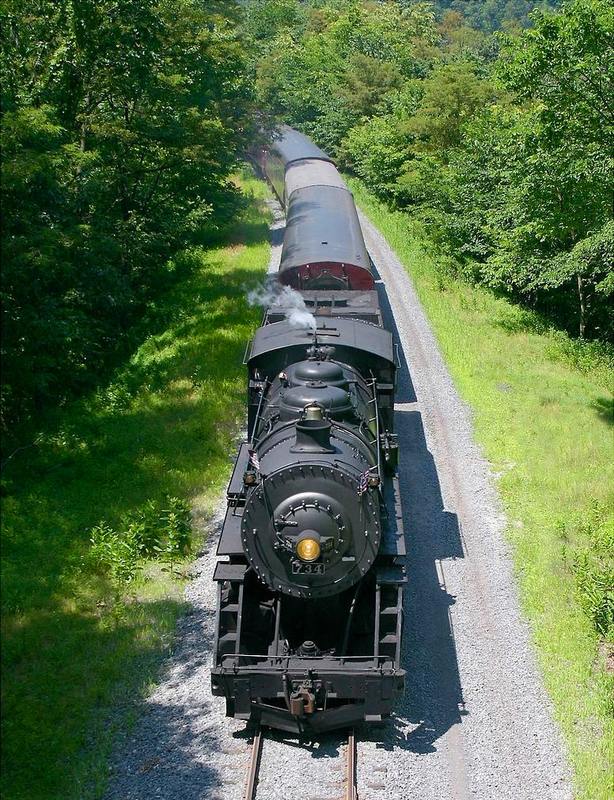 To learn more about the Western Maryland Scenic Railroad please click here to visit their website. 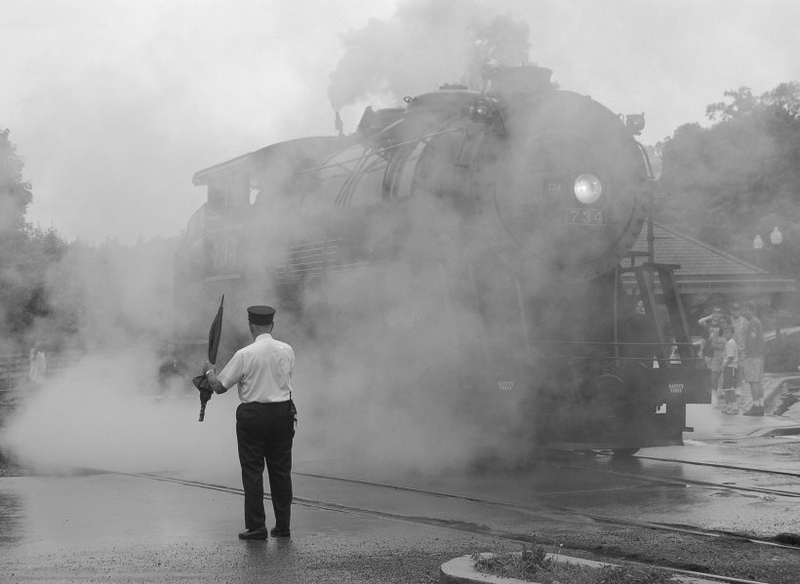 There you will find everything you need to know about planning a trip to the railroad as they offer complete information regarding everything available, excursion schedules, special event dates, nearby dining and lodging, and much more.